← QotW: What’s your best Mr K story? There’s nothing like a good, honest work truck. 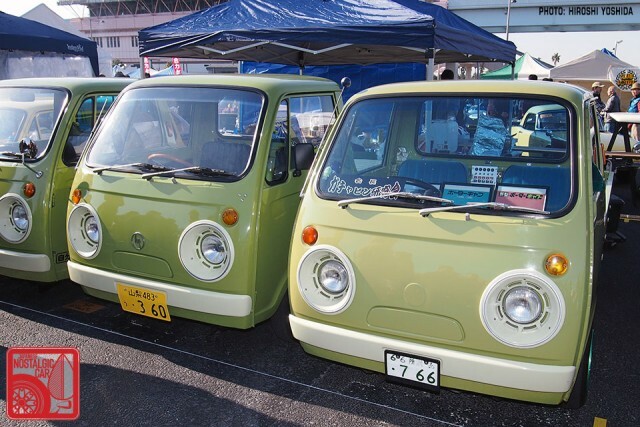 In fact, many of the earliest forms of four-wheeled transport in Japan were commercial vehicles, but precious few, like this row of forlorn-looking Mazda Porter Cabs, have survived till retirement without major wear and tear. Here are the best workhorses from the 2015 New Year Meeting. 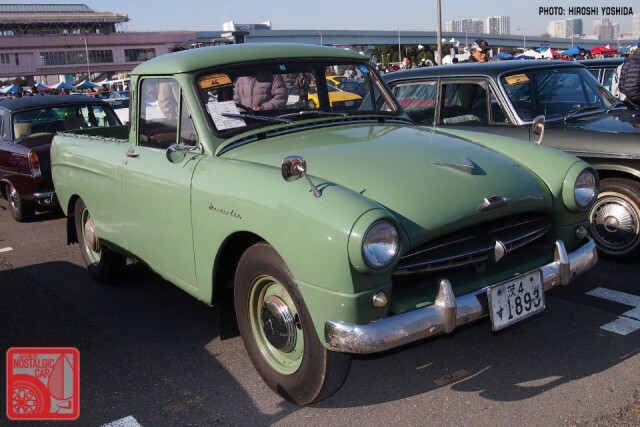 Based on the original 1955 Crown was the Toyopet Master, a de-contented commercial sedan version that usually served as a taxi. From that came the Masterline, a truck with body styles that included a van, double-pick and regular pickup like seen here. Today, this would be the equivalent of, say, a Toyota Avalon pickup, which sounds pretty darn cool if you ask me. Clearly maximizing platforms was a big priority in the early days. 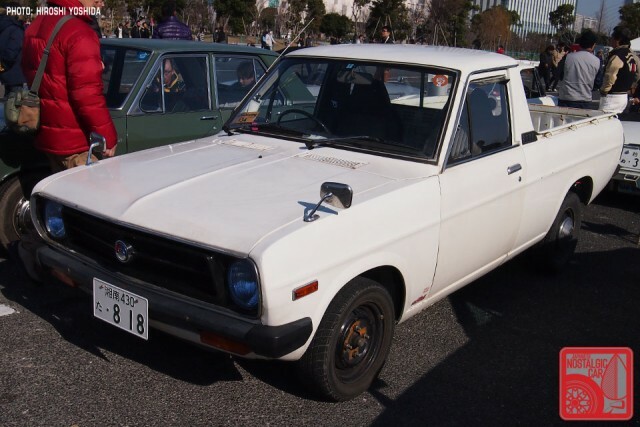 In similar fashion, Nissan took the 210 sedan and chopped off the back to make this Datsun 220 truck. If you notice the naming convention, it precedes popular US mini-trucks like the 520 and 620 by several generations. 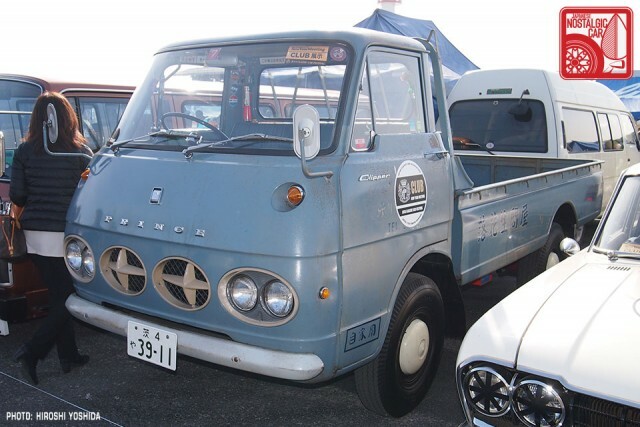 Even today, go anywhere in Japan and you’ll see an army of kei trucks whizzing around, and back in the 1960s it was no different, except they all had Iron Giant robot faces. 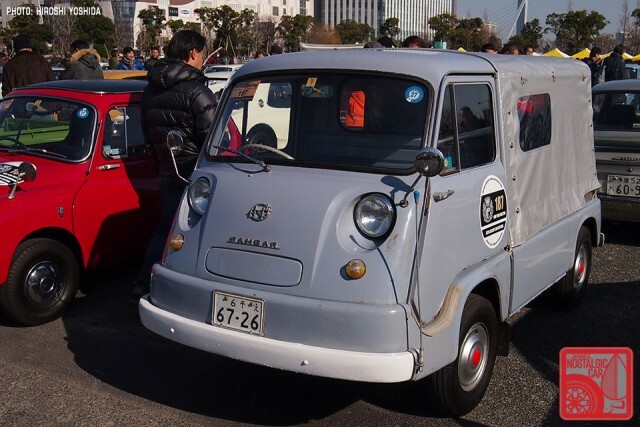 From the friendly Mazda Porter Cab (lead photo) to the stoic first-generation Subaru Sambar, these early trucks had personality. This was a low-floor pickup version with a canvas top serving as its sole cargo protection. The second-generation Sambar upped the cute factor substantially and was still sold in countless configurations but was still powered by a rear-mounted 360cc two-stroke twin. Bonus points for vintage Coca-Cola box. Sunny-based B120s trucks aren’t all that rare, but are cool nonetheless. They continued to be sold in Japan until 1994 and in South Africa until 2008. Because parts are so interchangeable with the sporty Sunny it was based on, many old work trucks have seen second life as hot rods, filling a niche similar to that of the El Camino in the US. The appropriately-named Carry was already in its seventh iteration by 1976. It also proves one need not a car-based ute to show off some shakotan flair. 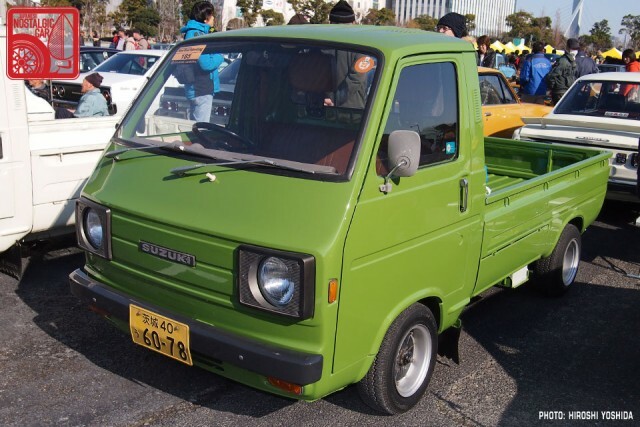 A Suzuki Carry pickup in the perfect shade of 1970s avocado green can exude cool. 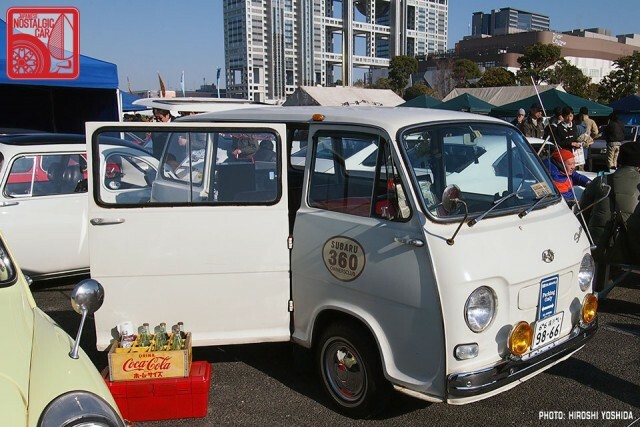 Even some of the food trucks at the New Year Meeting were cool: a Toyota Liteace serves lunch and a Suzuki Every ice cream truck doled out dessert. 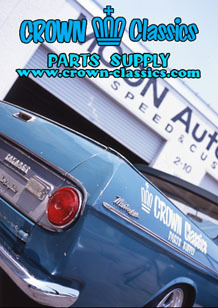 Before the merger with Nissan, Prince Motor Company was responsible for large commercial trucks and luxury sedans. 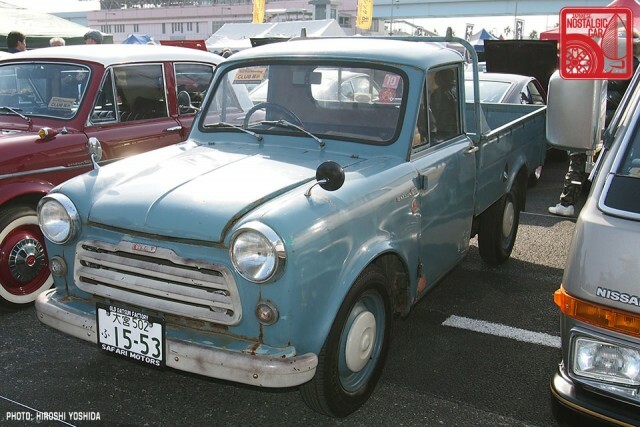 Thanks to its distinctive grille, the Prince Clipper was an icon of the Showa era. Size-wise, they are comparable to an Isuzu/GM NPR COE of today. 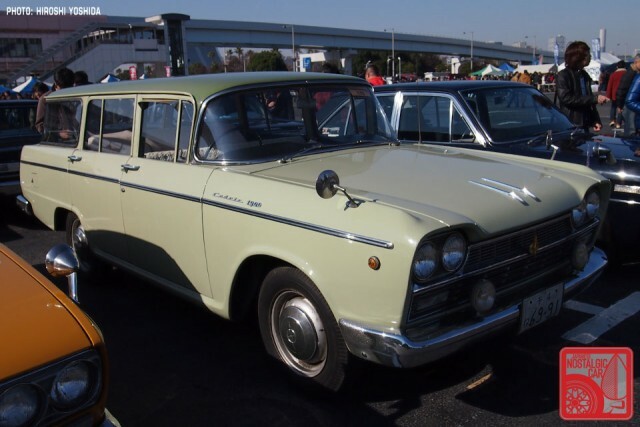 The 31-series Nissan Cedric was a massively popular full-size sedan in 1960s Japan. Though sedans are relatively common nowadays, wagons are fairly difficult to come by. A beautiful two-tone matcha green one with complementary green roof, doubly so. The parking area revealed a few more gems, including a baby blue B110 Sunny Van. This one appears to have some mixed and matched bits, like a GX hood and post-facelift grille, not to mention a set of rare narrow Yayoi sakura wheels. All hail the Suzuki Mighty Boy, which likely boasts one of the smallest pickup beds of any ute ever made. Based on the Suzuki Cervo kei car, it turns the rear seats into a bed, but nothing fore of the doors changed. 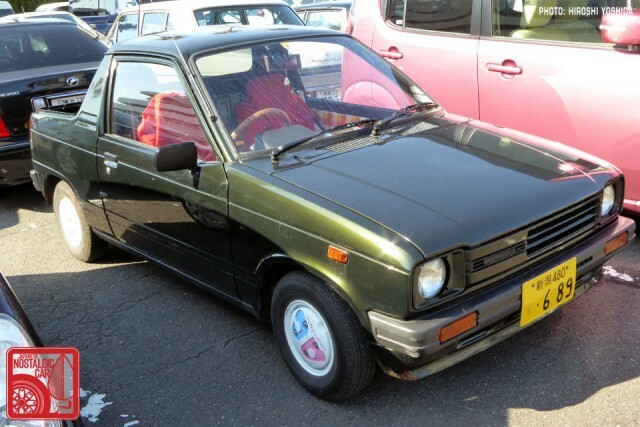 This one also comes with the very strange AC Courreges wheels, based on the fashion clothing line popular with the 80s kei car crowd. Completely ignoring the Ferrari to his left, our photographer Hiroshi Yoshida opts instead to take a picture of the 40-year-old Toyota station wagon with the bumper mounted parking marker. We don’t blame him. The X20-generation Mark II wagon is rare in any body style, all but extinct in wagon form. We’ve seen more of them in the US than Japan. Last but not least, parked next to a Chevy Astro was a Mitsubishi Galant Sigma wagon. 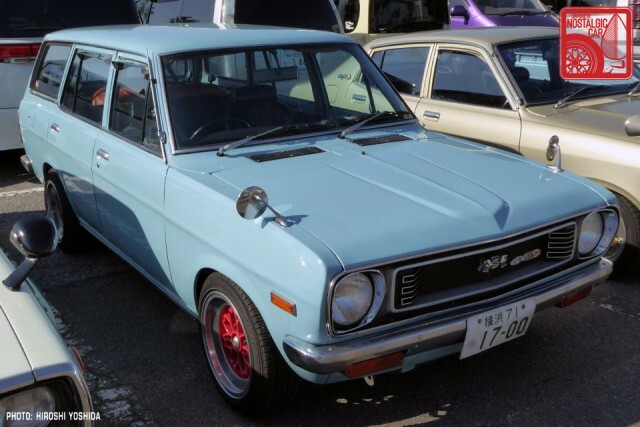 Sold in the US as holdover for the upcoming “modern” front-drive Chrysler K-cars (not to be confused with kei cars) Dodge Colt wagons for a blink-and-you-missed-it moment, the boxy profile belies a crisp style in its protruding-prow hood, swept lower greenhouse line, and flat rear wheel arch. Another rarity, even in its home market. 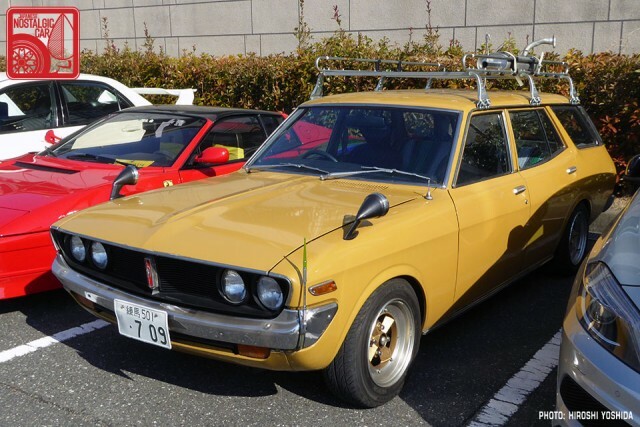 We have more 2015 New Year Meeting coverage coming up, but in case you missed it here’s Part 01 — Sixties Sports, Part 02 — Sports Coupes and Sports Sedans, and Part 03 — Bone Stock Beauties, Part 04 — Shakotan Sleds, and Part 05 — Racers and Replicas. Also, check out our New Year Meeting coverage from 2013, 2012, and 2011.
tagged: b110, b120, carry, cedric, clipper, datsun 220, Every, galant sigma, liteace, mark II, masterline, mighty boy, mitsubishi, new year meeting, nissan, prince, sambar, sanitora, subaru, sunny, sunny truck, suzuki, toyopet, toyota, wagons, x20. 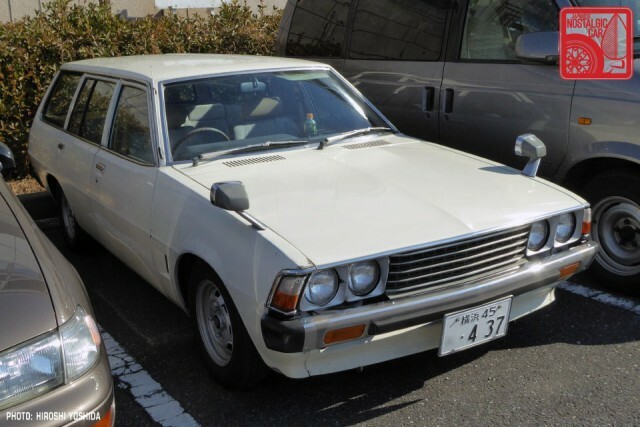 RWD Sigma-based Colt wagon was replaced by the K-Car Aries/Reliant; for 1981. FWD Colt wagons came along much later. Looks like there is a contender for National Lampoon’s Tokyo Vacation.